1. Bookies close your account, or restrict stake size, or withdraw BOG for you. 2. Insufficient liquidity on Betfair – you are competing with hundreds or even thousands of Arbers and Arbing Bots. In the time it takes to get the back bet on, theres nothing much available at the required odds on Betfair. So lots of work for little profit and some losses. 3. If you just do the backing part of it, expect long losing runs and periods of no increase in your account. The Bet Synergy graph shows no progress for about 1/4 to 1/3 of the time period – if the graph is of results for 1 year this is bad enough, if the graph is for 3 years it is, for most people, unacceptable. Hi I did look into it and sent some relevant concerns and questions but no one ever got back to me which put me right off!!! This tactic is well known but its amazing how hard in practice it is to place these bets fast enough and all the outsiders are usually bigger prices on betfair and the other end of the market tends to balance with each other very quickly!!! HiI’ve worked for both sptors and financial spread betting companies so the answer depends upon what you are betting on.Sports bookmakers (including the few sptors spread betting companies) will let people win for a while because the theory is that they will lose eventually. Some people however are talented gamblers and their accounts used to be closed. That practice received bad publicity. Instead, now, the bookmakers are less likely to close your account and more likely reduce the amount you could bet so that your bet is meaningless. The hope is that you will go elsewhere.Financial spread betting is different. Some companies will take the bet on’ ie essentially become a financial bookmaker. Other companies will simply hedge the bet against other investors. Often they will hedge your bet off on the underlying financial market itself – because of the volumes they trade, the spread betting company itself can get a better price than you. They can make a small margin on that bet.Talking with an ex-trader at FinancialSpreads, the current practice is a combination of the two. They try to segregate the client base into talented investors’ and novice investors’. They hedge off the talented investors’ trades. They may take on’ the novice investors’ trades.In short, because the financial spread betting company is able to pass the bet on, the spread betting company doesn’t necessarily lose money if you win. Therefore your account is unlikely to be closed.In fact most spread betting companies would like a lot of winners. They could hedge off all those trades, make a small margin and they would have a very active client base.Either way, a word of caution, financial spread betting has a habit of catching people out. New investors get over confident, increase their stakes and then lose. It’s not for everyone. Stop Losses’ can help restrict your losing trades. Discipline is needed. Good luck. the only problem you will encounter with this is after a short while the bookies wont accept your bets. Can confirm Davi’ds comment. I used a variation on this method for 3 months last year and by Dec using £100 stakes, Stan James banned me completely, PaddyPower, Ladbrokes, Skybet, Corals all offered me alternative stakes of such a low level (Skybet offered me an alternative stake of £1.10 for £100 stake)!! BetVictor would take stake but stopped giving me best odds before start. Only one who did take stake all the time was Bet365. Having all of the aforementioned taken away there are not many others that would give you a better price than Betfair by checking Oddschecker. So basically I’ve stopped doing it. You can use this tool to work out how much to stake on the 1st and 2nd favourite http://dailypunt.com/dutching-tool/ so that you get the same profit whichever wins. With regard to comparing betfair to the bookies prices as above what is the best time to do the comparison, i.e. morning prices or just before the race. Anytime from when the bookies first price up until about 10 minutes before the start is good. 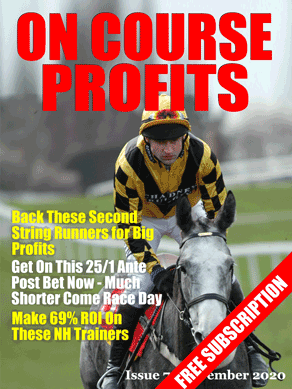 Once the on course prices go up all the bookies align and any differences between the course and Betfair disappear.